DYNAGROOVE, now with Peanut Butter! Phast Phreddie the Boogaloo Omnibus and Peanut Butter Brown swing at the DYNAGROOVE! November 14 is the birthday of our pal and fellow DJ Peanut Butter Brown. For the last year or so, he has been busy organizing a cool soul music party in Harlem called The Uptown Getdown. 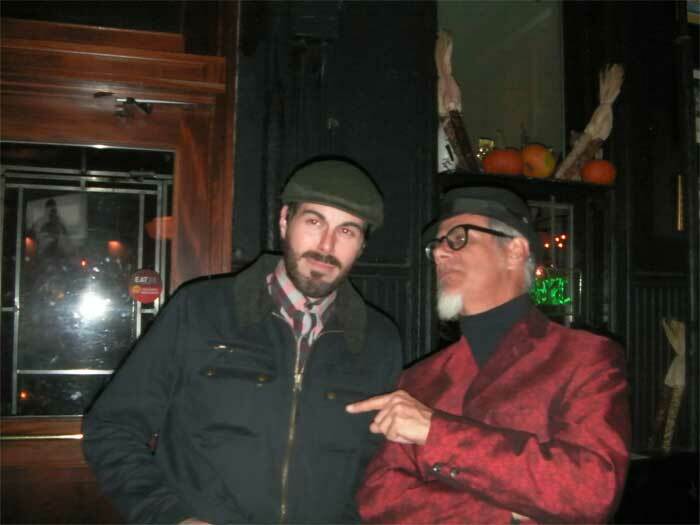 In fact, one was held the night before this (the 13th—see previous Boogaloo Bag entry). The 14th happened to fall on a DYNAGROOVE night, so a Peanut Butter Brown birthday bash featuring all soul music all the time was most certainly called for. The evening at Teddy’s Bar & Grill commenced with host DJ Phast Phreddie the Boogaloo Omnibus swingin’ with the soul music as Mr. Peanut Butter dined on the excellent fish tacos, newly added to the menu. Then, Mr. Peanut Butter took control of the room by playing many of his favorite soul 45s, including the one by Carl Carlton. During the evening several local DJs were on hand to dig the scene, including Nogood Nick, Jumpy, Mr. Fine Wine and One Mint Julep. Some came to salute Mr. Peanut Butter, others to eat Teddy’s fine food and everybody dug the great music. Nogood Nick and Phast Phreddie the Boogaloo Omnibus discuss one of the finer points of soul music at the DYNAGROOVE!